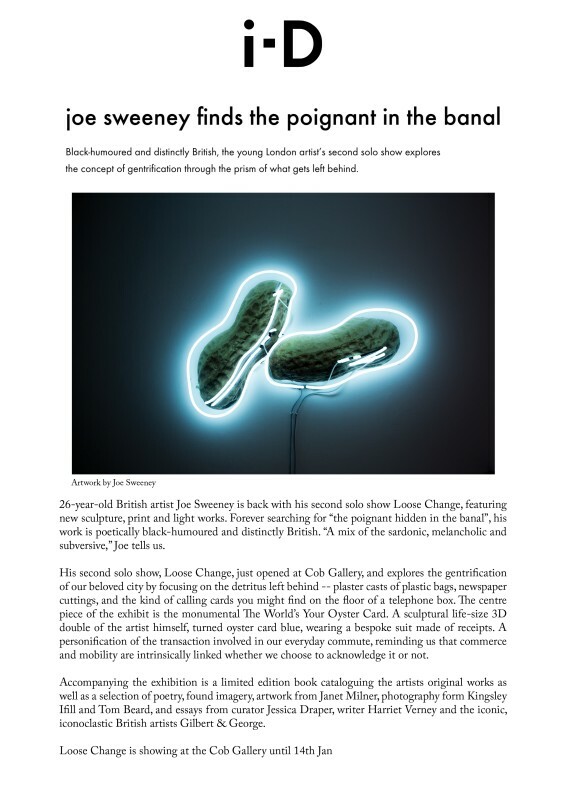 26-year-old British artist Joe Sweeney is back with his second solo show Loose Change,featuring new sculpture, print and light works. Forever searching for "the poignant hidden in the banal", his work is poetically black-humoured and distinctly British. "A mix of the sardonic, melancholic and subversive," Joe tells us. His second solo show, Loose Change, just opened at Cob Gallery, and explores the gentrification of our beloved city by focusing on the detritus left behind -- plaster casts of plastic bags, newspaper cuttings, and the kind of calling cards you might find on the floor of a telephone box. The centre piece of the exhibit is the monumental The World’s Your Oyster Card. A sculptural life-size 3D double of the artist himself, turned oyster card blue, wearing a bespoke suit made of receipts. A personification of the transaction involved in our everyday commute, reminding us that commerce and mobility are intrinsically linked whether we choose to acknowledge it or not.